IIUSA has published the EB-5 processing statistics through Q42012 recently released by USCIS to AILA. 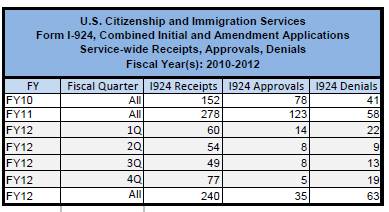 The report shows that USCIS has been particularly busy with I-526 petitions, of which it received 6,041 and processed an impressive 4,634 in FY2012 (ending 9/30/2012). This year saw a record number of I-526 approvals and a record number of I-924 denials. The approval percentages for investor petitions fell slightly from FY2011, down to 79% for I-526 and 92% for I-829, while approvals for Regional Center applications and amendments tanked to an average 36%. IIUSA has published an article on “THE IMPACT OF CHINESE QUOTA RETROGRESSION ON EB-5 INVESTORS AND EB-5 INVESTMENTS” by Tammy Fox-Isicoff and H. Ronald Klasko. I also recommend Kate Kalmykov’s blog post on Understanding the Implications of Retrogression in the EB-5 Category and her follow-up post EB-5 Retrogression for China Unlikely in 2013, According to Department of State. Also note that the State Department website now has an informative EB-5 page. Thank you, Suzanne for your timely updates. I notice there were only 712 I-829 submissions in 2012. In 2009, there were 1262 I-526 approvals. Why almost half of I-526 approvals have not led to I-829 submissions? Your guess is as good as mine. One factor is variability in the time to get a visa interview or pass the I-485 adjustment process, which means that people who received I-526 approvals at the same time may receive green cards and therefore reach I-829 at different times. 3 years from 2009 I-526 approvals to 2012 I-829 submission should be sufficient. I-829 submission should start 1 year 9 months after obtaining conditional green cards. Looking back, there were 2345 I-829 submission in 2011 when there were only 640 I-526 approvals in 2008. There were more I-829 submissions in number than I-526 approvals 3 year before in prior years. Yes, thank you, Suzanne, for sharing this with us all. The figures are interesting and hopeful, but I still say that the Approval Percentage is not very illuminating. Just doing some simple sums we see a backlog of 3,936 for I-526 applications and 1,817 for I-829 applications. The Approval % is only for the number of applications adjudicated (Approval+Denials) many of which are from the previous year! The Backlog as a % of the number of applications Adjudicated during the year is: another 85% of the I-526s adjudicated in 2012 are in backlog, and another 228% of the I-829s adjudicated in 2012 are in backlog. I just got my non RC eb5 investors approved by AAO. Very encouraging! congratulation, Lou. How long it took you to get I-526? Why AAO? It was denied by uscis first, then appealed to AAO, got approved from AAO 5 month later the appeal. Can you share some details about your experience. I specialize in non-regional center EB-5 projects as well. My investors were approved in 4 months early this year. I would like to know the reason of your denials so we can learn some important lessons and make non-regional center EB-5 a viable alternative for EB-5 investors. You can find me on Linkin. Suzanne – thank you for this information. Can you tell me how you calculated the 36% approval rating for 2012 I-924 applications or what chart indicates this. And how is approval rating generally defined for a year (i.e. number of applications approved divided by reciepts in a fiscal year or does it include applications made in prior years?) Thank you for your insights. Hi Ramesh, thank you for your comment. To calculate approval rate, I ignore the number of receipts and just divide the number of petitions/applications approved by the total number of petitions/applications adjudicated. So for I-924 adjudications in 2012, 35 approvals divided by 98 decisions (35 approvals + 63 denials) equals 36% approval percentage. Considering processing times and backlog, I think it’s safe to assume that most of the petitions and applications adjudicated in 2012 were received in 2011 (or earlier). I don’t believe that such stats exist yet, unless self-reported by regional centers. Hi Suzanne, thank you for your sharing, could you please tell me where you got the datas, because I cannot find them in the USCIS website? Many thanks.